A surprise visit with the grandkids!!!!! Lucky us! Roger and I got to take Lily and Charlie to see the award winning CCES Middle School Tree at the Hyatt House, part of the Annual Festival of Trees event. The CCES Middle School tree was inspired by THE LION KING JR and honored Maggie's School in Africa. It was decorated with awesome clay african animal ornaments created by the 5th grade in our art class. The MS Arts Guild then wove their special magic into the tree by adding some of the costuming from THE LION KING JR. To say that the tree is amazing is an understatement!!!! Gathering 100's of acorns and painting with watercolors in my studio were the other highlights. 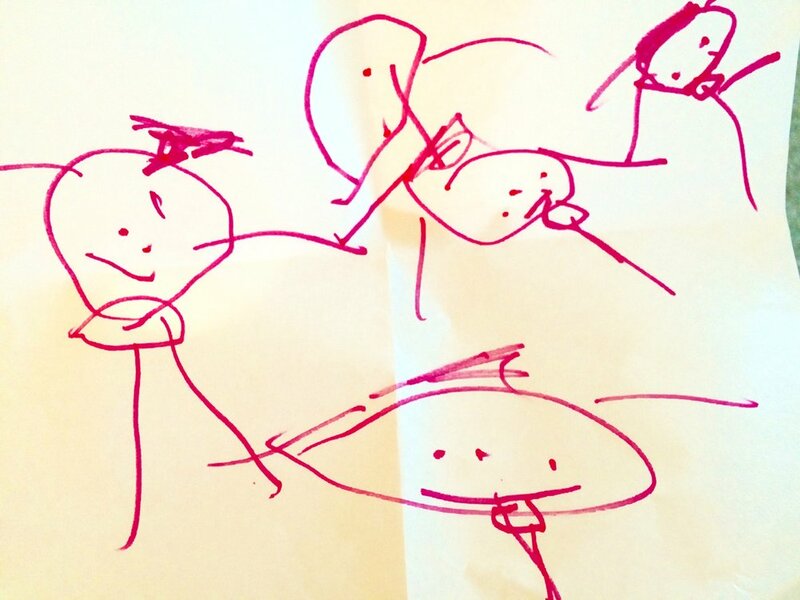 Charlie also did a drawing of our family holding hands. It is delightful! Do you recognize me on the far left??? ?